The recreation of a Macedonian sobor - festive gathering - features traditional dances, music and costumes of the Povardarje region near the capitol city of Skopje. 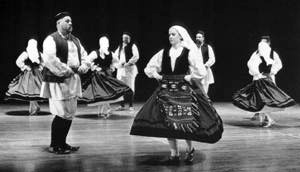 Many of these dances can still be seen today at village gatherings, weddings, and saint’s days. In older times, such festive occasions gave young people a rare opportunity to meet and select future mates. The scene opens with a shepherd and a kaval (end-blown flute) player wandering by. When two interested girls try to join in, the shepherd playfully shoos them away. The girls run off to get their friends, who all return to dance the Pletenica and chase the boys around. Not to be outdone, the boys leave to gather the men-folk, who return to dance the stately Adana. The girls begin the dance Potrčano, and are soon joined by the men to dance as partners. An old-fashioned older man enters and separates the youngsters, reminding all that this unseemly dancing goes against village tradition. However, the reason for the festivities becomes apparent as a new bride enters with her family and husband. The girls gather to dance Nevestinsko Oro (bride’s dance); the bride and groom are blessed while all sing solemnly of romance and promises. The mood lightens as everyone joyfully sings Zurli Treštat Nasred Selo and continues the dance with the macho Teško Krstačko, then Čučuk for everyone, ending finally with Skopska Crnogorka.